This is a Burton Suit Jacket Blazer. It is Grey. Chest: 44" Regular. Shoulder to Shoulder: 19.5". Armpit to Cuff: 16" Shoulder to Cuff: 26". Armpit to Armpit when laid flat: 23.5". 1 Back Vent. Colours on the photos may not be exact. Well made and beautifully finished formal charcoal grey blazer. Fully lined in grey satin. Front detailed button fasten. Why Buy From Us?. - BURTON MENSWEAR GREY BLACK WHITE CHECKED JACKET. - UK SIZE CHEST 36 INCHES REGULAR. - COLLAR . - POCKETS. - BUTTONS. - SINGLE BREAST JACKET. - 45% WOOL. - SHOULDER PADS. - HIP LENGTH JACKET. - THIS JACKET IS PREOWNED BUT OVERALL IN VERY GOOD CONDITION PLEASE SEE PICTURES PROVIDED. MEN'S FAUX SUEDE TAN WARM JACKET, USED IN GOOD CONDITION. WASHABLE. MEDIUM CHEST 38-41". COMFORTABLE AND LIGHT TO WEAR. SOLD FROM SMOKE FREE HOUSE. NEED ROOM IN WARDROBE- NO DEFECTS, NO RETURN. New and preloved clothing of exceptional style, quality and value. Marks and Spencer | Next | Dorothy Perkins | Prada | Gucci | Christian Louboutin. Shoulder to sleeve:24.8". We are DKStyled. Pit to pit:20.8". Burton Smart Blend Blazer Sand 40R. 46% Polyester 26% Lyocell 10% Linen 10% Cotton 8% Viscose. 2 button fastening. 2 inside pockets. Patch pockets. J720 MENS BURTON NAVY BLUE MILITARY PEACOAT WOOL BLEND JACKET MEDIUM M 40"
XS S M L XL XXL 3XL 4XL. WAIST 28 30 32 34 36 38 40 42. PIT TO PIT 22". CHEST 34 36 38 42 44 48 50 54. J183 MENS VINTAGE BURTON GREY BLUE WOOL OVERCOAT COAT LARGE L 42"
WAIST 28 30 32 34 36 38 40 42. CHEST 34 36 38 42 44 48 50 54. PIT TO PIT 16". This item is used unless stated otherwise. Pucker Clothing UK. Perfect For Your Designer Collection, 100% Authentic. PUC UP1 RL. General Interest. ITEM CONDITION. Wash before getting in touch. Length: 30". Cool burton nylon inner lining inside jacket. waterproof zippers. color is Black. fully taped and zip seams. removable waist gaiter. WARM AND FRIENDLY. 10,000mm Waterproof / 10,000g Breathability. Thermacore Insulation (200G Body / 120G Sleeves / 60G Hood). Chest Pockets. No size label. A traditional dinner jacket with silky collar. It fastens with buttons at the front and has light shoulder pads. It has a rear vent. It has silky lining. Inventory #: 4H3. Condition: this item is in okay pre-owned condition! Overall this piece looks great and you will love it at a fraction of the price! Design / Pattern / Colour: Black Grey. Cool burton nylon inner lining inside jacket. water column 10,000mm / breathing activity 5,000g. waterproof zippers. color is Black. SLASHED DOWN. fully taped and zip seams. removable waist gaiter. So the story of unfolds, life for this once loved item now resided to a box on our shelves. We know you really want it, but withlimited quantity available you'll need to hurry before it's gone. Very soon you realise it's far too much effort for a couple of quid. Blue Hooded Padded Jacket With Neoprene Sleeves. Blue lightly padded zip through jacket with contrast neoprene sleeves, hood and contrast black and white sleeve cuffs. Machine washable. MENS NAVY PEA COAT LOGG H&M SIZE M. Condition is Used. Dispatched with Royal Mail 2nd Class. A stunning beautifully tailored jacket from The Burton Collection. Pure new wool. Dark grey colour with a very subtle blue fleck (if you look really closely!). Length from nape of neck is 29.5". Double vent at the back. Mens coat. Size UK Medium. Condition is Used. Zip is broken but can use buttons. Very warm coat for winter, cold, snow rain and windy periods. 3 pockets, 2 on the outside and 1 on the inside. Can take the faux fur hood off if you like attated by buttons. BURTON Tailored grey blazer jacket. Striped (blue stripes). Overall, in really good condition. In used but IMMACULATE CONDITION !! FAB JACKET. Burton size XL. Gold tone contrasting zip fastening up the front. Inventory #: #94C1. Design / Pattern: Beige Solid Colour. WARM AND FRIENDLY. 10,000mm Waterproof / 10,000g Breathability. Thermacore Insulation (200G Body / 120G Sleeves / 60G Hood). The White Collection. Chest Pockets. Color is Murphy / Stout White. Snow guard in both sleeves. 10,000mm waterproof / 10,000g breathability. GO RIDE NOW. Pocket key clip. Pass pocket. Adjustable cuff closure. BURTON Men's LAUNCH Snow Jacket - Red/Blk/Iron - XLarge - NWT - LAST ONE LEFT! Signature confirmation may apply. Pocket Key Clip. Pass Pocket. Adjustable Cuff Closures. Color is " Golden Oak / Chestnut". DRYRIDE 2-Layer Blocked Solid Polyester Plain Weave and Solid Polyester Canvas Weave Fabric. Mapped with 40% Recycled Content THERMOLITE® Insulation [80G Body / 60G Sleeves] and Blocked. Size : 40R. Button Fastening. Size Chart guide. Australia Size. Japan Size. UK Dual Size. Really nice jacket that only looks better with age. Burton Man's Wear Red Birch Fur Hooded Padded Jacket Size Large. Fur hooded puffer jacket with an arm badge. Machine washable. Colour: RED. 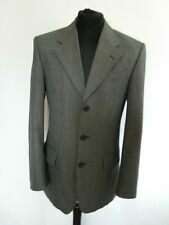 A mans Burton,s suit jacket in grey stripe, in a size 46 chest, worn once or twice but is in excellent condition. Absolute bargain - Burton sporty bomber jacket in medium size. Has only had light use.